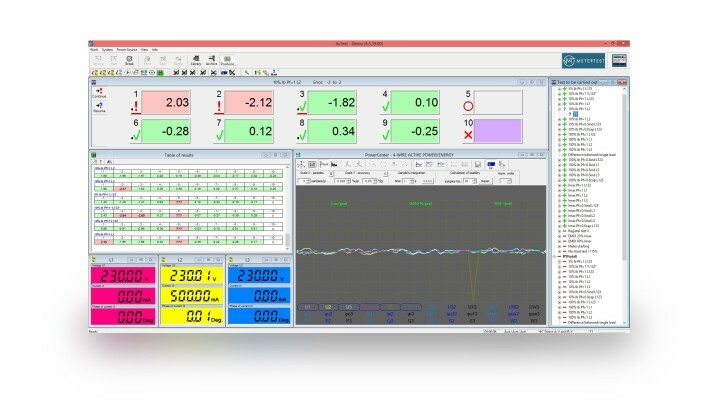 The entire measuring process is controlled through the Session Wizard, which even for a beginner, enables a quick and efficient passage through the whole process of calibration and verification. For production volumes, an extremely simplified operational mode is available – only one button is sufficient for an operator to perform the full testing process. The testing process is accompanied by a comprehensive set of visualization tools such as tests results, accuracy trends, panel meters, vector graphs, waveform curves, harmonics display etc. Correct software operation requires the definition of meter types, test types and additional parameters, all saved and organized in database libraries. Thanks to an innovative approach in the database structure design, filling them is extremely easy and intuitive. Allows to define utility and reference meters. Utility ones, form simple inductive up to complicated multi-energy/tariff and smart meters. Reference ones, form simple with constants table up to fully controlled through their communication port. Built-in library of tests offers standard tests like accuracy, dosage, starting current or no-load, but also many special tests for checking functionalities of meters (e.g. registers, profiles, ripple, dips and interruption), automatic calibration, remote control of the ASTeL system, commissioning, collaboration with the factory’s traceability systems and other. All tests are reusable which means that the same test definition could be used for testing different types of meters. Sequence is a flexible set of tests and can be run in automatic, semiautomatic, manual or a single test mode. Software offers wide range of task oriented user definitions. Libraries cover not only meters/tests/sequences definitions, but also waveforms, dips, interruptions, ripple telegrams, etc. Feature-rich standard and user defined reports are an integral part of the software. Export is available to standard forms like TXT, Excel files or any other requested format or database. All data related to the process of verification and/or calibration can be archived: data from meters, definitions of the tests performed and detailed results of each test. The archive can be searched according to data category: by date, type, serial number, producer, person performing verification, customer, etc. It is also possible to generate reports or export results from archived data. The software enables fully automatic testing of reference and portable standards, without the necessity of taking manual action by the operator. Calibration of the ASTeL meter test equipment can be performed by means of any reference meter available on the market. The process can be carried out in fully automatic mode. Extension of the system functionality is possible by means of scripts written in VBScript or JScript. To meet the actual requirements and adapt to the habits of customers, the software can be accordingly altered on request. Meters’ protocols Native: IEC 62056-21 (1107), DLMS, EDL, MODBUS, DL/T 645. Ready for other by external tools/scripts. (1) Further language versions are under development. (2) Further standards compatibility are under development or available on request.